Preheat oven to 350°F. Grease and flour a 9″ x 13″ pan. In a large bowl, sift together the flour, sugar, cocoa, baking soda, baking powder and salt. Make a well in the center and pour in the eggs, coffee, buttermilk and oil. Mix with a wooden spoon until smooth; batter will be thin. Pour into prepared pan. 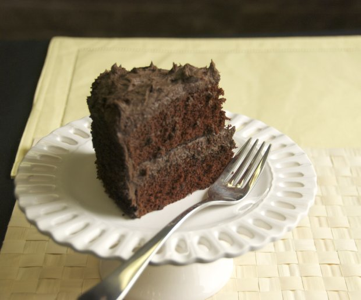 Bake for 35–40 minutes, or until a toothpick inserted into the center of the cake comes out clean. Allow to cool in the pan for 45 minutes. Once cake has thoroughly cooled, spread icing over the top.